Uggah (sixth left) with other invited guests at the event last night. 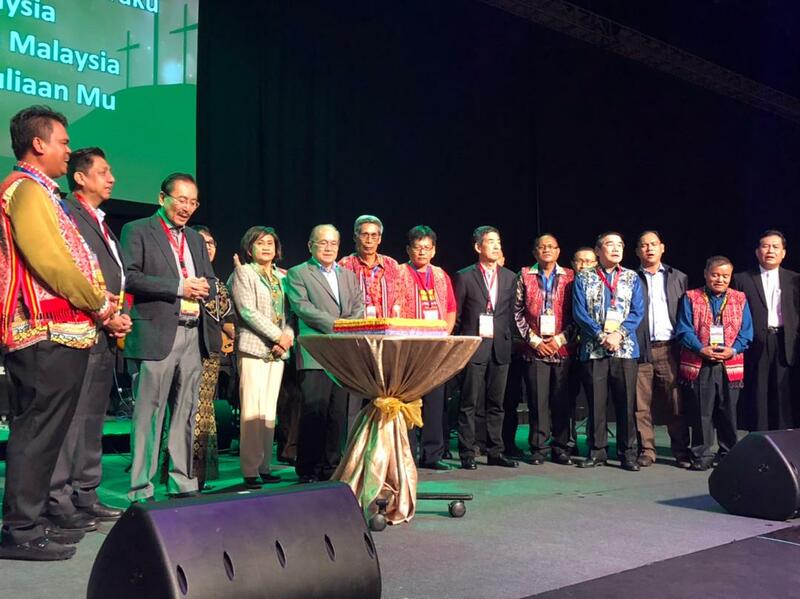 KUCHING: Up to 10,000 people from Sarawak, Sabah and Peninsular Malaysia are attending the 20th Gempuru Besai Iban 2017 gathering at Borneo Convention Centre Kuching (BCCK) which started yesterday. Themed ‘Thy Kingdom Come: Matthew 6:10’, the four-day conference was officiated by Deputy Chief Minister Datuk Amar Douglas Uggah Embas last night. The event will feature the programme ‘Night Miracle Rally’, starting tonight and Saturday from 7pm to 10pm. The night rally is themed ‘The Lame Walk; The Blind See; The Deaf Hear’. The rally speeches or sermons will also be translated into Iban language. When contacted yesterday, advisor to this year’s event organising committee, Janang Bungsu described the rally as a platform for Christian unity as the attendees from various denominations come from all over the country. “Where there is unity, there is power in the spiritual realm and hence, the blessings shall flow as per written in Psalms chapter 133, verses 1 to 3 (Psalms 133:1-3),” said Janang, who is deputy president of Persatuan Kristian Bahasa Iban Sarawak.